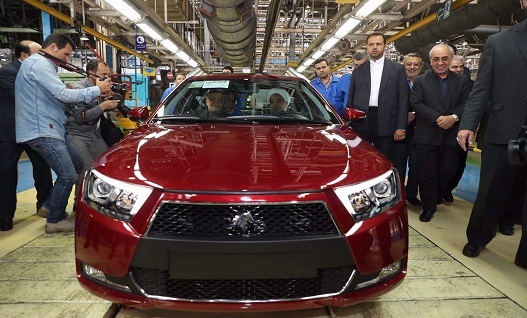 While the moderate forces of the Islamic Republic are rallying behind Hassan Rouhani and the conservatives behind hardliner Ebrahim Raisi, the presence of French car manufacturers in Iran is being used as a campaign tool by the incumbent president Hassan Rouhani to win the coming elections. PSA and Renault made a strong comeback into the Iranian market in 2015 following the resolution of the nuclear negotiations between the world powers and Iran. PSA has signed a 70 million euros deal with Iran while Renault has invested in a new plant in the country increasing production in Iran to 350 thousand units. The French companies, unlike their German and Japanese peers, have no productions and sales chains in the US making them not vulnerable to US sanctions. These companies are using their US absence to an advantage by moving swiftly into the Iranian market unhampered by competitors. Both companies report a 50 percent increase in the sale of Peugeot and Renault in Iran in the first quarter of 2017. Hassan Rouhani has presented the domestic production of Peugeot 2008 as one of the achievements of his administration following the easing of international sanctions negotiated by his team of nuclear negotiators. Meanwhile Renault and PSA are fast at work signing deals with Iranian automakers Saipa and Iran Khodro trying to bring their investments to the levels of activity before the imposition of sanctions. On the other hand, Volkswagen and BMW have taken a more cautious route and despite initiating certain talks and studies in connection with the Iranian market, have opted to stay put. Japanese companies have also kept clear of the Iranian market in recent years. In 2015 economic sanctions against Iran were dropped as a result of the nuclear agreement. However, the US has maintained certain restrictions on dealing with Iran for companies with presence in the US. Meanwhile President Trump has ordered a review of the nuclear deal with a view to ascertain if its provisions have been appropriately adhered to by Iran. For now, Trump has extended the sanctions relief under Iran nuclear deal but has slapped Iran with more sanctions related to the country’s ballistic missile program. In total seven individuals and companies of Iranian and Chinese origin have been added to the US Treasury Departments blacklist. US pressure has not however stopped auto manufacturing in Iran which has gone from 796 thousand units in 2013 to 1.23 million last year. Rouhani is presenting the increased production in the auto manufacturing sector as a sign of his administration’s success as well as the lack of vision of his opponents.